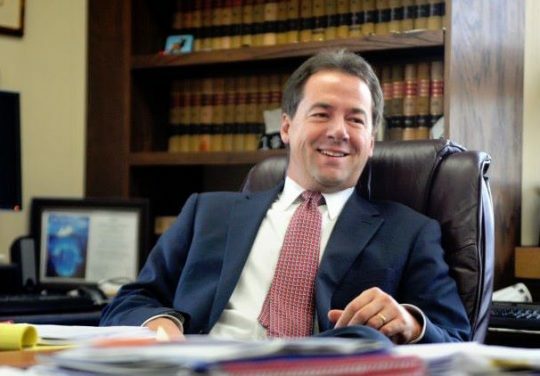 Bullock hired Kevin O'Brien in 2015, when Bullock served as chairman of the Democratic Governors Association. O'Brien left the post after an investigation found a woman's accusations of sexual harassment credible, the New York Post reported. He then found work as deputy chief of staff to New York City Mayor Bill de Blasio (D.) in early 2016, where he was again accused of harassment. Investigators confirmed "sexual harassment in violation of the city’s Equal Employment Opportunity policy," according to a heavily redacted seven-page report from the city Law Department. After declining to discuss the allegations during a Friday interview with Politico, Bullock offered his apology in a Medium post Saturday. In the post, titled "I’m committed to doing better," Bullock takes responsibility for allowing his aide to harm more women, and he describes his shock at the aide's initial transgression. Bullock describes how O'Brien "sexually harassed a colleague at an after-hours event." The governor says he found the behavior "inconsistent with the person I’d known for seven years and had come to call a friend. I’d never seen him act inappropriately. I’d never heard stories or complaints." Nevertheless, O'Brien left the office, albeit without any public explanation for the departure. Before O'Brien joined de Blasio's staff, New York's Department of Investigations reached out to the applicant's former places of employment as part of its standard hiring practice. The department contacted O'Brien's former offices as required, according to New York City Hall spokesman Eric Phillips. It "received confirmation of title and work dates and no adverse information," Phillips said. O'Brien acknowledged wrongdoing while working in New York, and Bullock's office admitted last week it had not warned de Blasio's office. In March 2018, investigators confirmed several accusations of sexual harassment against O'Brien. He resigned and admitted to wrongdoing. "There’s no excuse for what I’ve done. I’m embarrassed and ashamed. No one deserves to be treated that way. I’ve apologized to the people I’ve hurt and will continue to do so because I am truly sorry," he told the New York Times. Bullock's office admitted it had not warned de Blasio's office about O'Brien's behavior and the investigation. Ronja Abel, a spokeswoman for Bullock, explained the governor thought the firing would have been enough. "Gov. Bullock fully agreed with the decision to end Mr. O’Brien’s employment with the DGA," she said. Bullock "expected that having been held accountable for his actions, Kevin would not repeat this behavior." De Blasio ripped into O'Brien's conduct and the lack of disclosure from Bullock's office. "The whole thing is disgusting and it makes me tremendously angry that someone lied to us," he said. In his post Saturday, Bullock was similarly contrite. "Last week I learned he had again sexually harassed two women while working in the New York City Mayor’s Office," he wrote. "I felt sick and heartbroken. I felt the realization I hadn’t done enough." "I’ve spent the last few days talking to family, friends and coworkers," Bullock wrote. "Should I have called Mayor de Blasio? Should I have let more people know? Was I naïve to think this wouldn’t happen again?" Bullock comes down firmly in the affirmative. "The answer is yes. I was wrong and naive to think I did enough. … For that, I’m deeply sorry." Bullock is reportedly considering a run for the Democratic nomination for president in 2020. This entry was posted in Issues, Politics and tagged Montana, Sexual Harassment. Bookmark the permalink.